The marine applications for plastics are wide and varied. QD have the production capability to form some of the largest boat screens in Europe. From full form curved fly-bridge screens on 70 feet luxury powerboats to flat panel windows on yachts and cabin cruisers QD have the materials and production capabilities that are required. 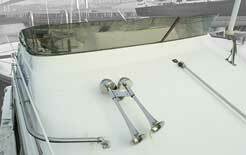 QD products fulfill the most demanding marine applications if designed to do so. Rudder bearings and fluid tanks can be manufactured to fit specific craft on a one off basis with simple drawings and dimensions form the client being all that is required. To request advice or to receive a quotation email, fax or phone QD using our details on the “contact us” page of the web site. Acrylic (PERSPEX, PLEXIGLASS etc.) are the materials from which a majority of marine craft windows are made of. It can be drilled and formed to suit the specific craft from templates or drawings supplied by the client. Other materials are sometimes used for specialist glazing on marine craft such as lifeboat windows which are made of a specialist silica glass coated polycarbonate which is expensive for application on pleasure craft but can be supplied if requested by the client. Standard polycarbonate is normally only used in the marine industry for control panel covers in areas were a heavy impact may be likely such as in the cockpit of a yacht or power cruiser. The reason behind the limited use of polycarbonate in marine craft is due to the materials hydroscopic nature, this means that the material absorbs water, salts, cleaners and general atmospheric pollution into it’s surface over a much shorter period of time than acrylic. The surface therefore takes on a scratched appearance and is hard to see through. Examples of products QD have made are rigid spray screens on ocean going yachts, vision domes for all-round vision from within the craft, power boat fly bridge screens, companion way wash boards, deck hatch panels and flat panel overlap mounted boat screens. Clear PERSPEX can be supplied from 2mm through to 100mm thick, tinted PERSPEX in 3mm, 5mm, 8mm, 10mm and 12mm thick dependant on colour sheet availability. Above 12mm thick QD implement a special lamination process to produce tinted panels of any thickness up to 100mm. The normal material used to manufacture small and medium sized marine craft steering bearings and bow rollers is Acetal also known as Delrin or POM. The bearings and rollers can be machined to suit the actual crafts shaft or drawings supplied by the client, bow rollers can be manufactured in a similar manor. You may hear some people refer to a bearing as a Nylon bearing, Nylon in it’s unaltered state is not usually suitable for use in a marine environment as it is a hydroscopic material and will absorb and expand when submerged causing binding of the bearing surfaces. Care should be taken if considering the use of standard unfilled Nylon as a bearing. Acetal can be supplied in sheet from 8mm to 100mm thick and round bar from 6mm dia through to 200mm diameter. Water and effluent holding tanks can be manufactured to suit specific craft dimensions with inlets, outlets and access panels all placed to suit the application, these can be manufactured from polypropylene or polyethylene to clients drawings and sketches. Contact us for further advice.